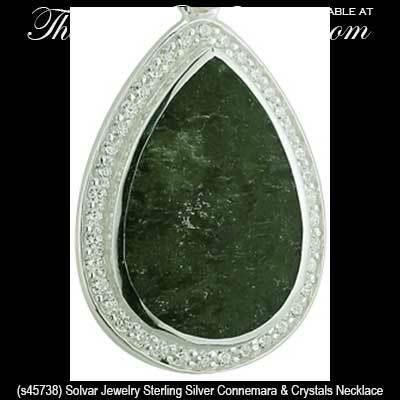 Connemara marble necklace is crafted in sterling silver and it is enhanced with CZ stones. The Connemara marble that is featured in this necklace is the only natural green marble in the world; fittingly, Connemara marble is only found in Ireland. This large, tear drop shaped, Connemara marble necklace is crafted in sterling silver and it is studded with CZ stones on the border. 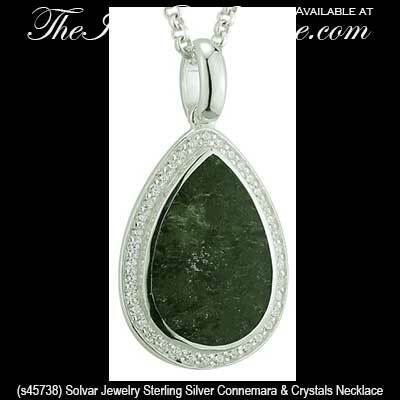 The Connemara marble pendant measures 3/4” wide x 1 1/4“ tall, including the jump ring and the chain bail, and it includes an 18" long sterling silver chain. This Irish pendant is made by Solvar Jewelry in Dublin, Ireland and it is gift boxed a Connemara marble history card, complements of The Irish Gift House. This Connemara marble necklace has been hallmarked sterling silver by the Irish Assay Office at Dublin Castle in Ireland. Connemara marble necklace features sterling silver accents that are studded with marcasite stones. 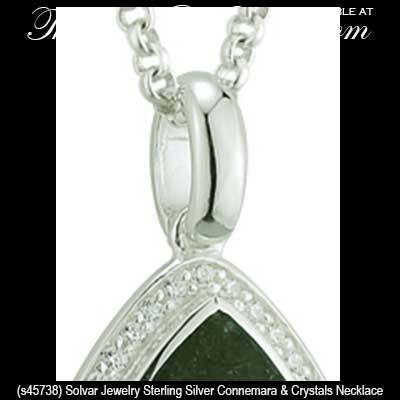 This sterling silver Connemara marble necklace is enhanced with marcasite stones. Sterling silver Irish ring features both Connemara marble and marcasite stones.